I just love bearded iris. Thanks to C.L. Fornari’s meme last month, by pure luck I had a ton of new visitors to my dusty little corner of the blogoverse. If you’ve come back, thank you, and welcome. I say it was by pure luck because the links are listed on J.L.’s site in alphabetical order by plant name, and my plant was chives. Now for this month…aconite, anyone? Asparagus? AAronroot? I just made up that last one, there’s no such thing as aaronroot. As far as I know. I decided to go back to the true spirit of the meme, which is that newbie gardeners sometimes get scared off by complicated instructions, or recommendations from one side to be all organic, and the other side to use blue chemicals on a regular basis. What people need is a slam dunk- something so easy you have to give away extras. 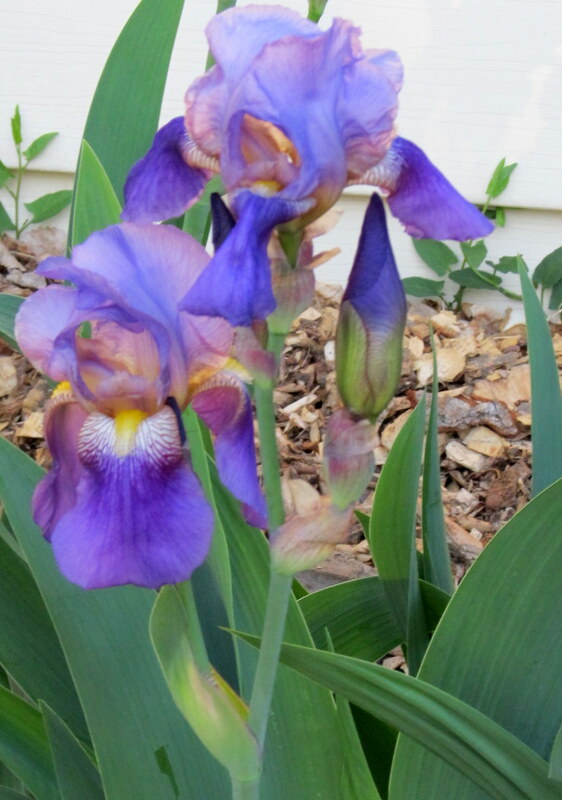 In my garden, bearded irises are a slam dunk. And toward the end of June, I will probably be giving away extras, if anyone local is interested. I use Iris a lot as a kind of placeholder- when my Korean lilac was 6 inches tall, surrounding it with iris made it look like a real garden bed, instead of a twig surrounded by mulch. Now that the lilac is about 4 feet tall, and covered with flowers, the iris anchor it, and are ready to be divided and given away. Once you get your bag with plants, sort them out. The best roots are big and fat. There should be at least one fan of leaves per chunk. I trim the leaves to about 6 or 8 inches from the rhizome, and plant it with the dangly roots in the soil, but the knobby rhizome just on the surface. If it goes underground, it rots. 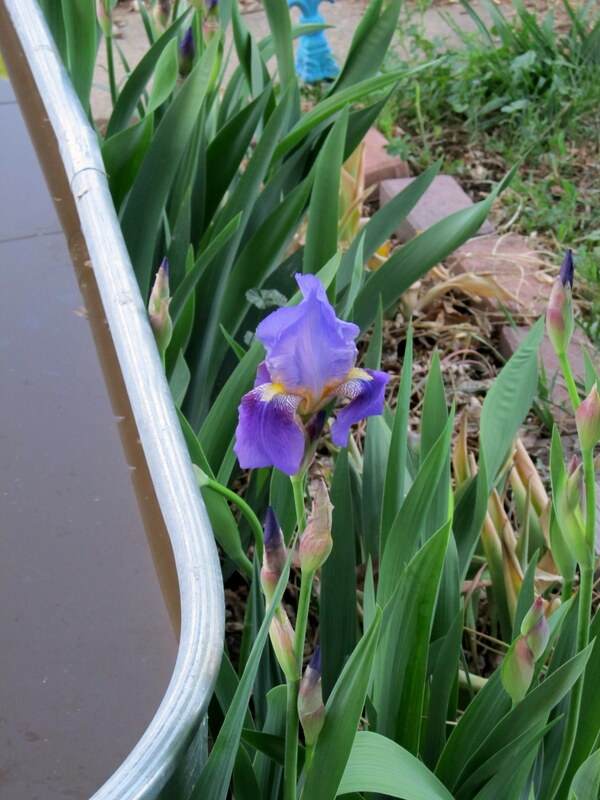 In fact, iris is nice and drought tolerant, not really caring whether it gets much water. Cutting the leaves back allow it to establish itself without drying out, but there are still green leaves to feed it while it makes itself at home. My wonderful MIL is the source of this information, and the source of all my iris as well. She has told me to transplant before July 4th. I don’t know if that is specific to zone 5, or the front range of Colorado, your mileage may vary in other parts of the world. What if you can’t bring yourself to make friends with a gardener? They sell bearded iris- McClure and Zimmerman has some in their Spring catalog for $11.95 if you buy 3. That seems expensive…but as I’ve said, I’ve never bought Iris. 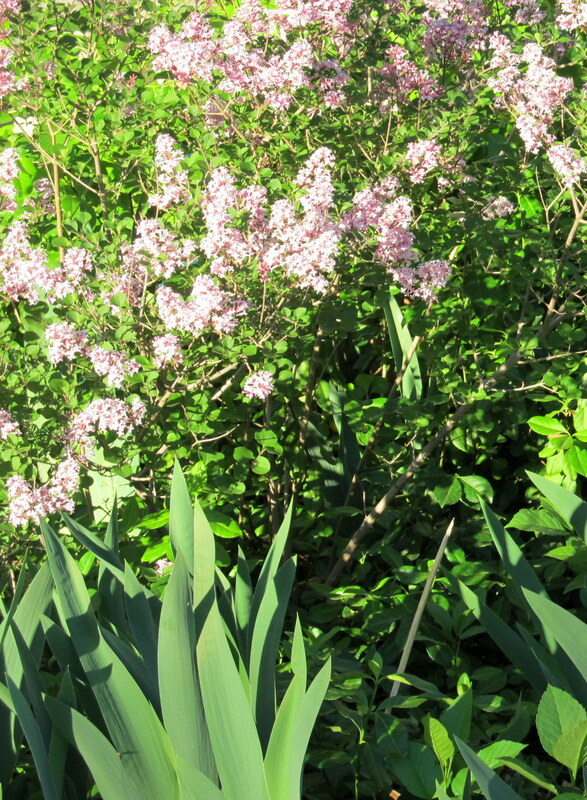 They also claim that a coral-pink variety named “Beverly Sills” is among the most popular. Hmmmm…I don’t know. Buying them would be the way to get unusual colors- most of mine are light purple, with a couple of plants that are dark purple, and one that is bronze-flowered, which blooms a week or so after the others. Trust me, you can grow that. Bearded iris are my all time favorite and each year I’m enamored with yet another color combination. Beverly Sills is absolutely wonderful. Mine came from a little older man who makes a hobby of dividing iris and selling them at a very reasonable price. Great find. I guess I would have to see it- “coral pink” just makes me wonder. I do have Blanche Sandman honeysuckle, which has coral flowers, so maybe it would go. What a beautiful story- any iris is beautiful.